Today our friends at Gardening With Children have a delicious and easy recipe for you. It starts with a classic Middle Eastern salad and wraps it in a pita to make a flavorful and portable sandwich! Please note, this recipe makes 1 sandwich. This recipe courtesy of thelemonbowl.com. Lay pita flat and spread hummus along the middle leaving space at the edges. In a small bowl, combine diced tomato with half of the cucumber (1/4 cup), za’atar, olive oil, half of the lemon juice (1 tablespooon) and salt/pepper to taste; spread on top of hummus in the pita. To create cucumber yogurt sauce, combine remaining 1/4 cup cucumber, yogurt, dried mint, garlic and remaining 1 tablespoon of lemon juice in a small bowl. Season with salt/pepper to taste then drizzle on top of the tomato salad. 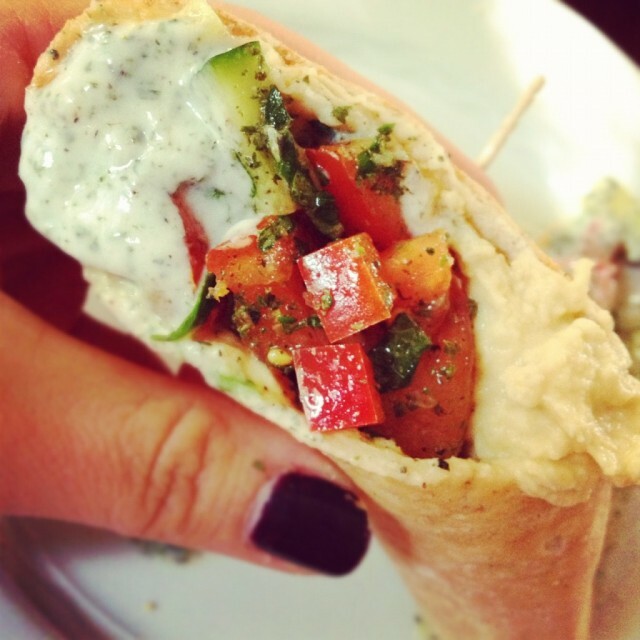 Roll pita into a wrap and slice in half to serve. Another option is to serve the salads on a big platter and use pita bread for dipping instead of creating a sandwich.